Many proud mamas and papas are taken back when their beautiful bouncing baby breaks out in acne at about the age of three weeks. Acne doesn’t just come at very time parents want their newborn to be at his or her most photogenic, it also comes at about the same time that baby becomes colicky, gassy, fussy, and keeps them up all night. 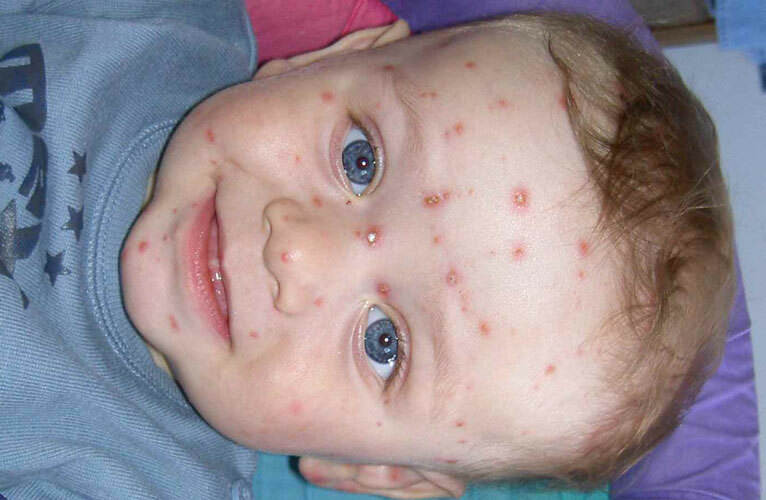 But at least infant acne is not a sign of a more serious health issue for the child. The best way to treat baby acne, which affects about 50% of infants, is make sure your baby has clean skin. Baby acne usually causes whiteheads and pimples on the child’s forehead and chin. Blackheads are not unheard of, but they are relatively rare. When the baby fusses, the flow of blood to the face makes blemishes more visible. Acne in infants results from a hormonal connection made between mother and child just before birth. The mother’s body sends a surge of testosterone to the baby in the uterus to complete the maturation of the lungs. The effects of testosterone on the skin are just like those that occur at puberty, except that they show up three or four weeks after birth and have completely disappeared by three to four months later. Is My Baby The Only Baby Who Ever Got Acne? About 50% of infants develop acne. Baby acne occurs in all races and on all skin types. Acne in infants is more common for certain skin types than others. If you have one child who has acne as an infant, there’s a good chance your next child will develop acne as an infant, too. This does not mean, however, that they will have more severe acne (or less severe acne) when they are teenagers. When it comes to skin care, babies are not smaller versions of teens and adults. An infant’s skin is delicate and scars easily. You absolutely, positively must not use “zit zappers” or heating devices, blue light, red light, or suction device’s on your baby’s skin. And tea tree oil can upset hormonal balances in babies and children up to the age of 13, especially boys. The best thing you can do for baby acne is to make sure your child has clean skin. This means making sure you wipe your child’s face after feeding, and you give your baby a regular bath. And since most new parents aren’t quite sure what to do when they have their first child, here is the knowledge you need to give your baby an anti-acne bath (which is the same technique you would use if your child does not have acne). Baby’s bodies don’t generate a lot of heat, and they are too small to hold a lot of heat. The very first thing you need to do before you give your child a bath is to make sure the room is warm, preferably around 75-77º F (24-25º C). It’s important your baby does not catch a chill. Select a convenient place to bathe your baby. In my family, babies usually got their baths on the kitchen table. However, a changing table or a kitchen counter will also do. Cover the area with a towel to catch those inevitable and endearing splashes. Make sure your baby doesn’t need a diaper change before starting the bath. Then lay out everything you will need for your baby’s bath. You need to a basin to hold baby and bath water, preferably with back support for the child. You will need warm water, at about room temperature. Baby will need a fresh diaper, fresh clothes. Anything you need for a diaper change you will also need for the bath. The wash cloth should be soft, not rough. But you don’t really need soap if all you are cleaning is poop, snot, and throwing up. If somehow your baby managed to get genuinely dirty, then you might consider Burt’s Bees Baby Bee Buttermilk Soap or maybe Free and Clear Liquid Cleanser for Sensitive Skin. Be sure not to use any product that is abrasive, sudsy (large bubbles damage delicate skin), or scented. Remove baby’s clothing but not the diaper. Bathing your baby requires two hands. You must hold your baby’s head above water at all times with one hand while giving you baby the bath with the other hand. Dip the wash cloth in clean water before putting your baby in the bath. The place your baby’s bottom on the bottom of the basin that you have filled with about 1 to 1.5 inches (2.5 to 4 cm) of water. Continuously supporting your baby’s head, start by washing the scalp, ears, nose, and chin. Don’t get water in your baby’s eyes. Shield your baby’s eyes with your hand if necessary. Work your way down to the diaper line, and then clean legs and toes. You will need to hold your baby’s head above water the entire time you are giving your baby the bath. Supporting your child’s head with one hand, remove clothing but not the diaper. With your free hand, dip your clean washcloth in the bathwater before putting the baby in. Then place baby’s bottom against the bottom of the bath basin you have filled with 1 to 2 inches (2.5 to 5 cm) of warm water. Now it’s time to take off the diaper to make sure the child is clean all over. It’s important to wash little girls in a motion from front to back to prevent bladder infections. Don’t worry about vaginal discharge in girls and circumcision scabs in boys. Leave them alone and allow them to fall off naturally. When the bath is done, take the baby out and get ready to dry off. Probably you know the rhyme, “Pat a cake, pat a cake, baker’s man.” There is a reason it is recited when babies are in the bath. It reminds the adults who care for them that their skin is gentle and needs to be patted—never rubbed—until it is dry. Always be sure to use a warm, clean towel. You can’t scrub your baby’s acne away, but you can help prevent new blemishes from forming. A good product to use on infant acne blemishes is Eucerin Aquaphor Healing Ointment. And if baby has dry skin with whiteheads, consider a somewhat more expensive product like Borage Dry Skin Therapy Natural Formula Children’s Lotion by ShiKai, which is safe for infant skin. Is A Portable Zit Zapper On The Way?